Welcome to our Maine State Facts section, part of an educational project designed to provide information about indigenous people in different U.S. states. Follow the links to the right of our tribal map for more information about the language, culture and history of each Maine tribe, or scroll below the map for Maine Native activities including a wordsearch, fact sheets, and words from the Native American languages of Maine. Feel free to print any of these materials out for classroom use! The traditional Micmac territory is north and east of Maine, in what is now Canada. In the 1700's, the Micmac, Maliseet, Passamaquoddy, Abenaki, and Penobscot people joined together into an alliance known as the Wabanaki Confederacy, and after that, some Micmac people settled in Maine as well. Their descendants still live in Maine today. There are five federally recognized Indian tribes in Maine today. Maine Tribes Word Search: Printable puzzle hiding the names of Maine's Indian tribes. Maine Language Greetings: Learn to say "hello" in several Native American languages spoken in Maine. Maine Native Animals: Learn the Indian names of native Maine animals. Maine Indian Facts for Kids: Answers to frequently asked questions about the Indian tribes of Maine. 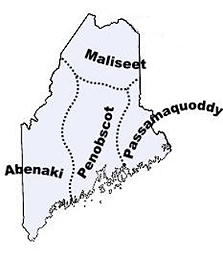 We currently have pages for the Abenaki, Penobscot, Micmac, Maliseet and Passamaquoddy tribes. Good history book on the Wabanaki Indians of Maine. Interesting biographies of four Maine Indian women. Introducing Maine's Native American history and culture to kids. Thorough reference book about the Native American tribes of Maine. The history of relations between Native Americans and European Americans in Maine. History of the Etchemin and Wabanaki Indians of Maine. Collection of 19th-century journals and maps about the Wabanaki tribes of Maine. Abbe Museum: People of the Dawn: Bar Harbor museum dedicated to Maine's Native American heritage. Passamaquoddy Teaching Kit: Online lesson plans about the Passamaquoddy tribe in Maine. Gifts From Gluskabe: Maine Indian Art: Photos and information about Maine Native American art. Wabanaki: Articles about native issues from the Maine Rural Development Council. Maine Native American Culture: Historical timeline and maps for the Wabanaki tribes. American Indigenous Studies: Maine: Resources and links about Maine Indian tribes. Indian Tribes in Maine: History and genealogy of American Indians in Maine. Maine Native American Resources: Maine Indian links pages. 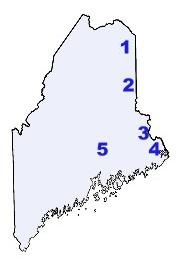 Would you like to sponsor our nonprofit work on Maine languages?